“The Jungle Book” (2016) has more in common with Rudyard Kipling’s original book than the 1967 animated movie does. The remake draws from both sources, weaving together more serious elements from Kipling’s book with the more happy-go-lucky original Disney film. This results in a better story being told in the remake. Mowgli (Neel Sethi), an orphaned boy, has been raised in the jungle by a pack of wolves until their peace is threatened by Shere Khan, the fierce, antagonistic tiger voiced by Idris Elba. Shere Khan was once severely injured by a man, feeding into his hatred for mankind and specifically for Mowgli. After Shere Khan begins stirring up trouble in the jungle, Bagheera (Ben Kingsley) starts to lead Mowgli back to the man village where he originally came from. However, the two become separated and Mowgli has to journey through the jungle on his own. The remake doesn’t follow the 1967 movie’s plot. Instead, it creates and tells a new version of the story of “The Jungle Book.” In my opinion, the remake’s story is a better and deeper one. All of the animal characters are created through CGI. The highly realistic animation contributes to the remake’s more solemn tone. While at times the talking animals comes across as a little unbelievable, the animation overall does an excellent job of creating the appearance of a realistic world that makes it easier for the audience to suspend their disbelief. Neel Sethi plays Mowgli, the only human to actually appear in the film. Other humans are only alluded to and shown indistinctly. Sethi does an impressive job for a child actor. There were a couple of times when his large chunks of dialogue seemed to be tumbled out. Overall, though, Sethi played the emotions convincingly and made a Mowgli that the audience could easily like and cheer for. 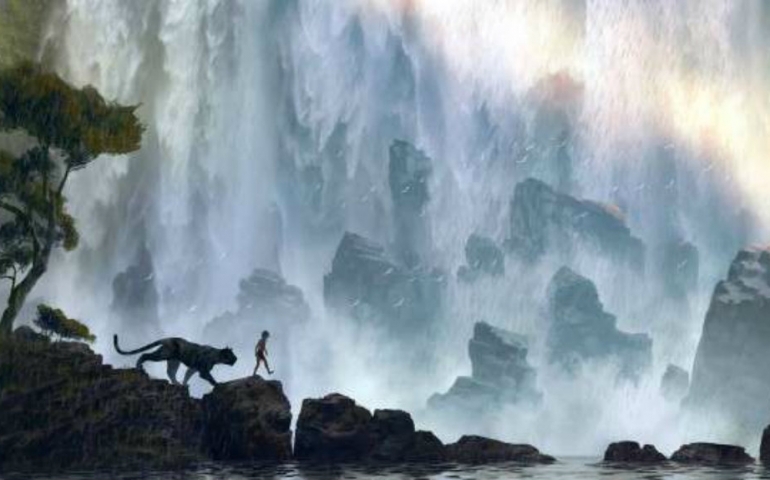 “The Jungle Book” boasts a high-profile cast of voice actors. Some of these voices are pretty recognizable, which could make it difficult for viewers to separate the character from the actor. Yet, the actors all do a great job at creating their distinctive animal’s personalities, and the voices all match their characters. Two songs from the original animated movie were performed within the remake. The most notable, perhaps, is “The Bare Necessities.” The song is sung in the movie by Baloo and Mowgli. Christopher Walken’s King Louie also sings a version of “I Wanna Be Like You” with updated lyrics. These songs are an obvious throwback to the original movie. The nostalgia factor attached to them will likely please many viewers who grew up with the 1967 movie. However, viewers less familiar with the songs may find their inclusion in the film to be jarring. Bill Murray’s Baloo seems to serve at times as the film’s comic relief. His dialogue is the most contemporary out of all the characters. Although I personally found the more modern speech and jokes a little disconcerting, the people I saw the movie with thoroughly enjoyed it, judging by their loud laughter. Overall, “The Jungle Book” appeals to both viewers looking for just the nostalgia factor as well as those who are unfamiliar with or uninterested in the original version. The visuals in the movie are gorgeous. The acting is superb. And, although the movie isn’t perfect, it’s greatly enjoyable and an excellent way to spend an hour and fifty minutes.